First published: October, 1991. First posted online: October 10, 2005. Something like that. We weren’t sure what we wanted to do with Persey yet either, so we decided it was time to go back into the dungeon. It was where all the jokes were stored, anyway. And what well-drawn, clearly marked dungeon doors Chris drew! You’d never confuse them for the “coffins” mentioned in the dialogue. Slash offsarcasm, this is one big reason Chris had hoped to colorize all of the strips by now to get those doors to pop with smoky, well-delinated evil portalness. Good Blood Circulation, rejected for October, 1991. This had better work. I’m the only person left who’s willing to hire you. It can’t fail. There’s a triple-strength love philter in Ogrek’s wine and a periapt of vampire-summoning in the window. When Persephone shows up, he’ll fall for her, she’ll bite him and fall for him, they’ll elope to the next duchy, and you and Joe will have no more problems! Excuse me, have you seen Joe? I think it’s his night to customize reliquaries. No thanks. But could I have this? It’s pretty. Q. 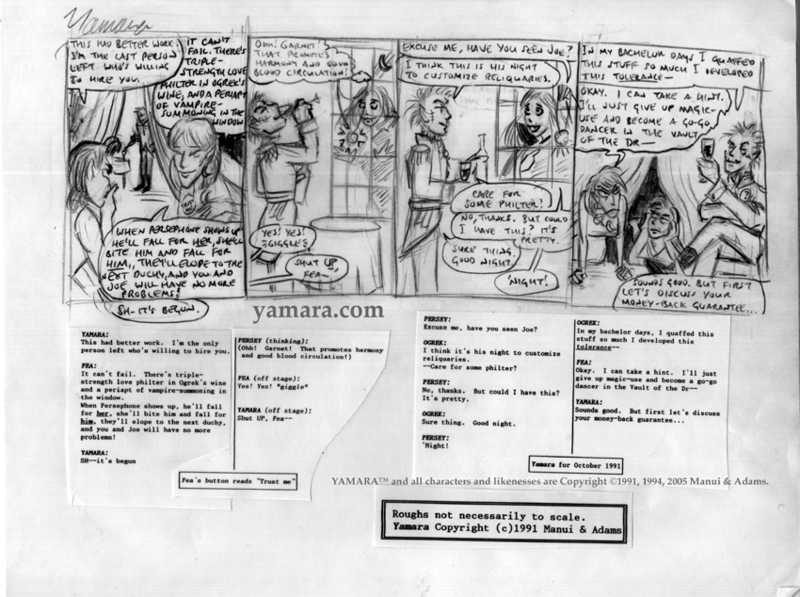 So how did you send these roughs in anyway? Did it take long? A. It took no time at all, since we sent them the Marty McFly way by fax! A. It’s a lesser-known sovereign against vampires; it basically works like garlic in windows. Ovid recommended it to combat striges. Q. Again, some assistance on the little hard-to-read words would be appreciated.